VFR might be the fastest-growing technology you’ve never heard of. 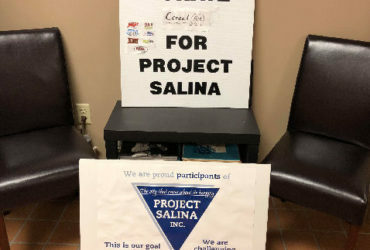 But thanks to Thursday’s donation of a 10-ton Lennox Variable Refrigerant Flow system and related equipment from Lennox International, future graduates of Salina Tech’s Heating, Ventilation and Air Conditioning program will be familiar with this technology. This donation was the latest in a series of donations stretching back more than two years, when Lennox chose Salina Tech to be the first college in the country the company would partner with to help train the next generation of HVAC technicians, said Bill Roberts, Lennox Kansas Field Technical Consultant. Currently, there’s a nationwide shortage of 25,000 HVAC technicians, and that shortage is expected to grow to more than 100,000 by 2022. Michele Neikirk, Lennox Technical Support Administrative Assistant, said the company now has partnerships with 12 colleges across the country, but that Salina Tech is now the first to receive commercial equipment from the company. “Being familiar with the equipment will open lots of doors for you students,” said Tom Pestinger, owner of Pestinger Heating and Air Conditioning and a former member of Salina Tech’s Board of Trustees. Dustin Pestinger, President of Pestinger Heating and Air Conditioning, and a current member of the Board of Trustees, said the company has been installing an increasing number of VRF units in schools and offices, including the company’s own headquarters building. “It’s definitely the wave of the future,” said HVAC instructor Chad Townley. Back in the classroom, Lennox Commercial Engineer Corey Bartlett gave the students an introduction to how VRF systems work. Bartlett said the technology, which allows a single unit to provide heating and cooling at the same time for different parts of a building, was invented in Japan in the 1980s, driven by the country’s limited energy and space for buildings. The systems are about 50 percent more efficient than conventional HVAC systems. Bartlett said he first heard of the technology in 2005, when he was doing engineering design work for a new building and his client requested it. Today, he said, VRF systems are used in about 80 percent of new buildings worldwide. In the U.S., use of the systems is growing about 15 percent each year.